NOTE (Gregor): PRESENTLY, THIS EXAMPLE SEEMS INVALID LOGICALLY (ALTHOUGH TECHNICALLY SCHEMA VALID) BECAUSE THE COLLECTION ARE MISSING. The XML file must be valid according to the scheme K2N.xsd and K2NDictionary.xsd. 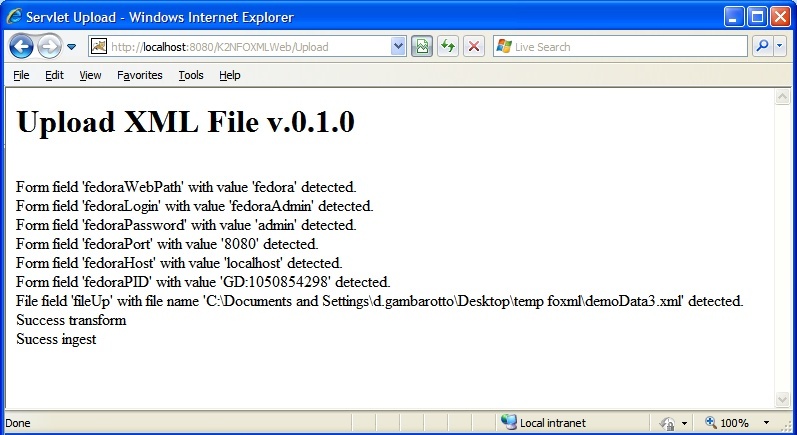 You can check the validity of your XML file by using online validation tool at http://www.xmlvalidation.com/. 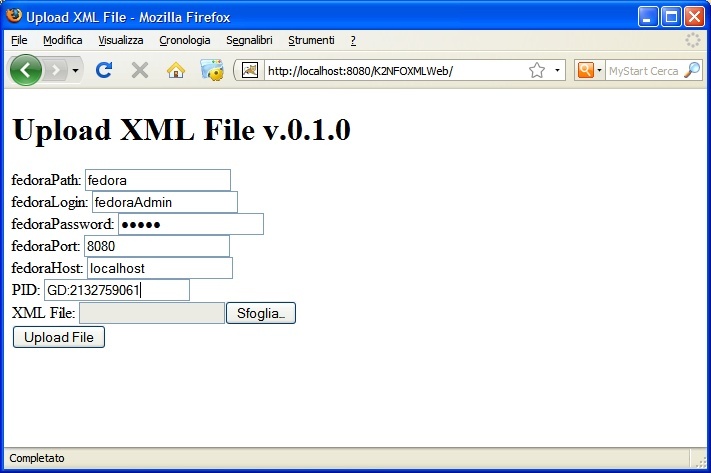 The tool allows you to upload the XML file as well as the required XSD files for validation. If your XML file is valid, the tool replies "No errors were found". If your XML file is not valid, a report is generated showing your errors and allowing you to edit the XML file for any corrections. Next image show successfully XML validation. You can upload those XML files to Fedora repository from http://<URL of application>. XML File: XML file to publish to repository. After clicking on 'Upload File' button, a page shows server messages indicating the success or failure of operation. This page was last modified on 16 November 2009, at 11:25.